Today’s plant for #WildEdibleWednesday is Goldenrod, or the 120 or so species in the genus Solidago. Like other members of the Aster family such as Liatris (our plant from two weeks ago), Chicory, and Valerian, Goldenrod has a wide range of powerful medicinal properties. Native to North America from the far reaches of northern Canada all the way south to Mexico, it has become widely naturalized throughout all temperate areas of the world. In most areas, it’s viewed as a pasture weed, although some varieties are cultivated as a garden ornamental. It is the state flower of both Kentucky and Nebraska, the state wildflower of South Carolina, and the state herb of Delaware. 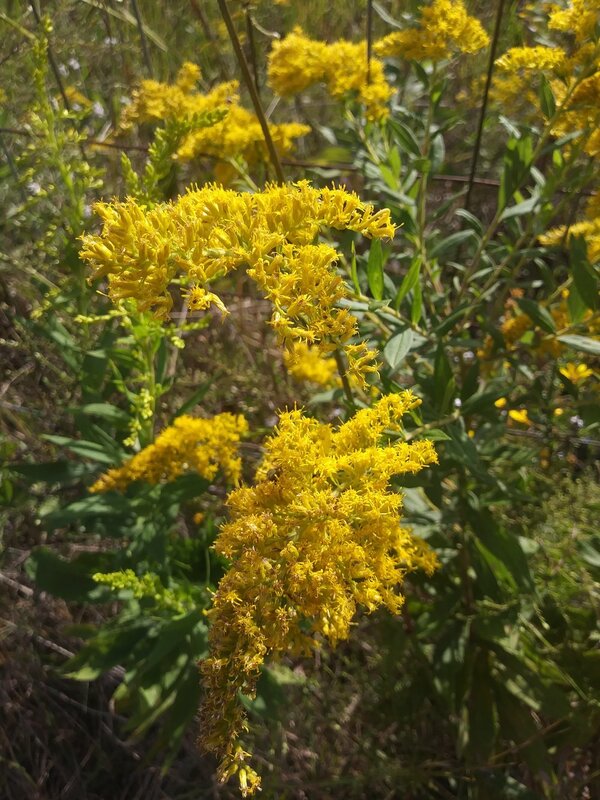 It is very easy to recognize – depending on the species, Goldenrod is between 3’ and 5’ tall when fully grown, with a bright golden inflorescence of tiny blooms. They are among the showiest native wildflowers – you truly can’t miss them, especially since they tend to grow in large patches, sometimes filling entire fields. The leaves are lanceolate and with tiny teeth and no leaf stem, and between 2” and 5” long depending on species. As mentioned before, Goldenrod is a pasture weed. It thrives in open areas such as abandoned fields, poorly maintained pastures, orchards, roadsides, fencerows, and your front yard if you’re really lax about mowing. The leaves and budding flower heads are edible, although cooking is advisable. The leaves can be used in place of spinach, and have a similar flavor. From my research, the flower heads are delicious fried, although they are best eaten before they fully bud out. I’ll definitely have to give that one a try next spring. For survival purposes, Goldenrod is a great firecraft plant. The dry, fluffy seed heads make a superb flash tinder. They are beginning to mature now, and will be widespread by the end of October. To harvest, just pull handfuls of the white, fuzzy seeds off the head of the plant into a container for later use. They are abundant and effective. But plant medicine is where Goldenrod really shines. Like other members of its family, it has strong antiseptic, diaphoretic, analgesic, and antifungal properties. A poultice made from the roots is useful for treating cuts and burns – the analgesic properties help dull the pain, and the antiseptic functions prevent infection. The leaves and blossoms can be chewed and the juice slowly swallowed to treat sore throats, mouth sores, and fungal mouth infections such as thrush or coated tongue. If you’ve ever been up to SARCRAFT and seen me demonstrate how to chew Sourwood leaves, it’s the exact same process. A tea made from any part of the plant is great for treating kidney or urinary tract infections. The tea functions as an antiseptic to actually treat the infection, and the stimulant and diaphoretic properties help to flush your system. Finally, the plant can be infused as part of an herbal salve (like we did in the Plant Medicine class) for topical relief of muscle aches and pains. Goldenrod gets a bad rap for causing fall allergies, and it’s not surprising why… the bright yellow flower heads look like pure pollen. However, it’s really a case of mistaken identity – Common Ragweed blooms at the exact same time as Goldenrod, and its pollen is lightweight, windblown, and highly irritating to most humans. Goldenrod pollen is sticky and heavy – too sticky and heavy to be blown by the wind and inhaled by people. Goldenrod is exclusively insect-pollinated. Bees love it, and it’s a great honey plant. If you’re noticing a #WildEdibleWednesday trend that some of the most useful edible and medicinal plants around are commonly cast aside as weeds, you’re right. Goldenrod is another great example. So before you spray, pull up, or cut that weed in your yard or field, look it up first. It might just be worth saving.